Updated map of territorial control and fighting in Mali, as of May 4, 2013. Map by Evan Centanni, modified from Wikimedia map by Orionist, using images by Carport and NordNordWest (source). License: CC BY-SA. 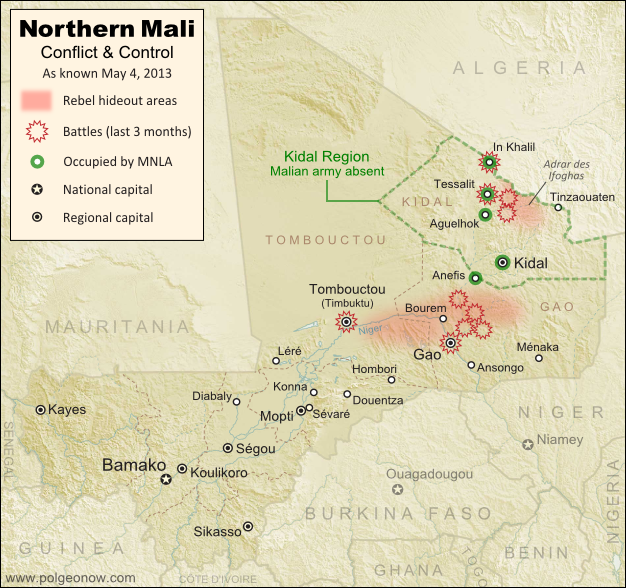 Since our last Mali update in February, the country's religious extremist rebel groups have continued their retreat from the northern cities that they controlled for half a year. The military intervention by France and Mali's neighbors has somewhat reunited the country, though with some important exceptions. In Mali's far northeast, French and Chadian forces have driven Ansar Dine and Al Qaeda in the Islamic Maghreb (AQIM) out of the important towns of Aguelhok and Tessalit, afterwards seeing heavy combat in the nearby mountains of the Adrar des Ifoghas, where Chad claims to have killed two key regional Al Qaeda leaders. Though many rebels are said to have fled the country, some are still holed up deep in the mountains, and have launched terrorist attacks on the regional capital of Kidal. Northern Mali's biggest city, Gao, was secured by French forces early in the intervention, and is now patrolled by troops from Mali and other African countries. 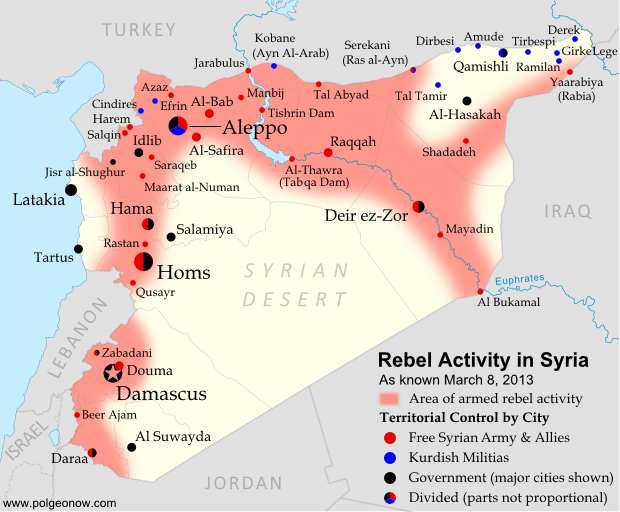 However, the Al Qaeda-offshoot rebels of the Movement for Unity and Jihad in West Africa (MUJAO), who ruled the city for months, have continued their resistance, initiating two major battles in Gao during February, and another in March. 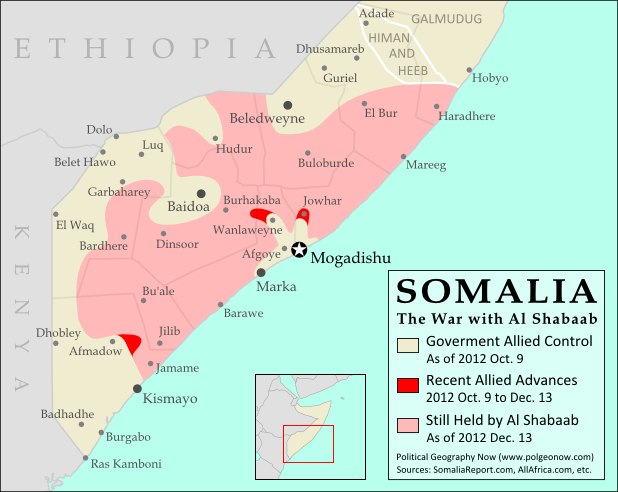 Timbuktu has faced similar attacks, which have been variously attributed to either MUJAO or AQIM. MUJAO fighters are now based in the villages and countryside surrounding Gao, especially just across the River Niger and in the valleys to the northeast, where French soldiers have been involved in lethal confrontations with the militants. The stretch of the River Niger between Gao and Timbuktu has also seen MUJAO activity, but at least one major town along the route, Bourem, has been secured by the allied forces. The National Movement for the Liberation of Azawad (MNLA), a secular rebel organization made up mostly of people from the Tuareg ethnic group, has sprung back to life in Mali's far northeast. It now occupies most of the Kidal region, including the capital and key towns, cooperating with the French and Chadian armies but forbidding Malian troops from entering. The group, which initiated the rebellion in northern Mali last year - declaring an independent country called "Azawad" before being pushed out by Ansar Dine and MUJAO - now seeks again to negotiate with the Malian government. It has ceased its explicit calls for independence, even saying it "recognizes the borders" of Mali, though it has since begun issuing official "Republic of Azawad" documents to drivers passing through Mali's far northeast. This second rise of the MNLA was made possible by concerns that Malian soldiers were abusing, and in some cases murdering, Tuareg civilians in the cities they had retaken. Kidal, unlike Gao and Timbuktu, actually has a Tuareg majority, and the MNLA is relatively popular there. After the extremist Ansar Dine rebels fled from Kidal ahead of the French advance, the MNLA welcomed the foreign troops, cooperating with the soldiers from France and Chad. 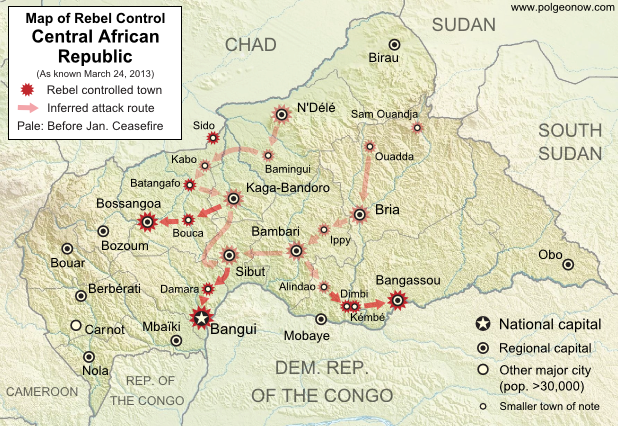 The Malian army, apparently sensing it's not welcome, has mostly not entered the region. The MNLA now operates a checkpoint in Anefis, on the border of Kidal and Gao regions, and has defended itself against other rebel groups in the surrounding desert as well as in the town of In Khalil on the border of Mali and Algeria. In February, the MNLA also claimed control of Menaka in Gao region, but the town is now known to be under the control of African troops from neighboring Niger. The future is not at all certain for Mali's north, with Islamist militants still active and the MNLA calling for greater autonomy against the wishes of the Malian government. Deepening the uncertainty, France and Chad, by far the two strongest armies currently in Mali, are both beginning to withdraw their forces, not wanting to become stuck in an ongoing guerrilla war. However, there's still hope for Mali not to descend back into chaos; the U.N. security council has authorized a peacekeeping mission to take over starting from July, which will work under the name Multidimensional Integrated Stabilization Mission in Mali (MINUSMA).